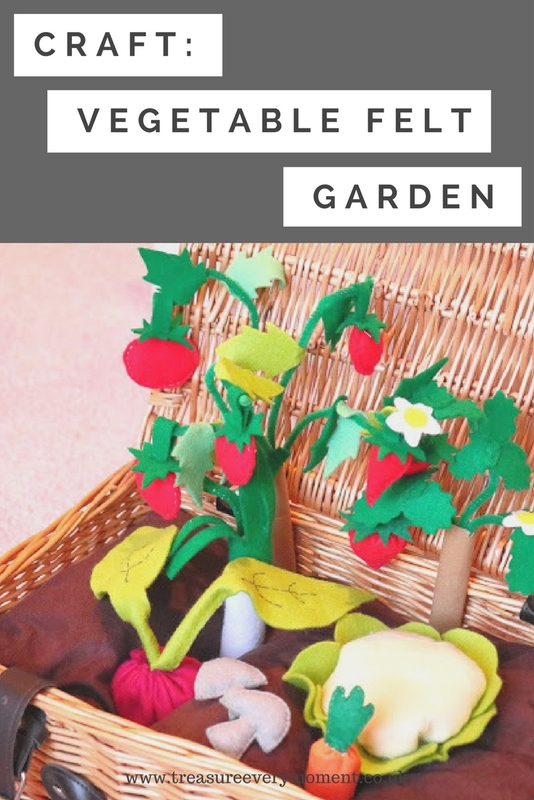 Creating a felt vegetable garden is something I had wanted to do for Isabella for such a long time, after spending hours pinning ideas and inspiration on Pinterest. I thought my very basic sewing skills would make it difficult to make, but as you can see I somehow managed to make Isabella a little felt vegetable garden. 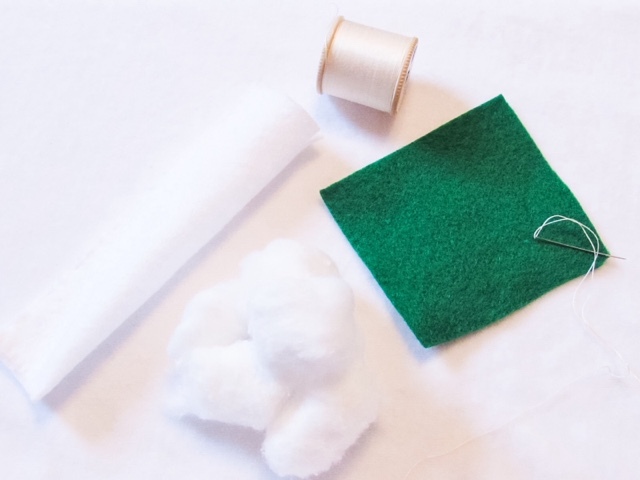 If you're looking for a detailed tutorial on how to make one then there are probably more informative posts out there, but if you're after basic instructions (ideal for a complete sewing novice) then this is the post for you. I picked up almost all of the things you'll need from Hobbycraft and everything else was recycled from around our house. 1) Decide which vegetables you want to make. I made a beetroot, leek, cauliflower, carrot, mushrooms, strawberry plant and tomato plant. Most of the vegetables are made in the same way, the only thing you need to change is the template of felt. 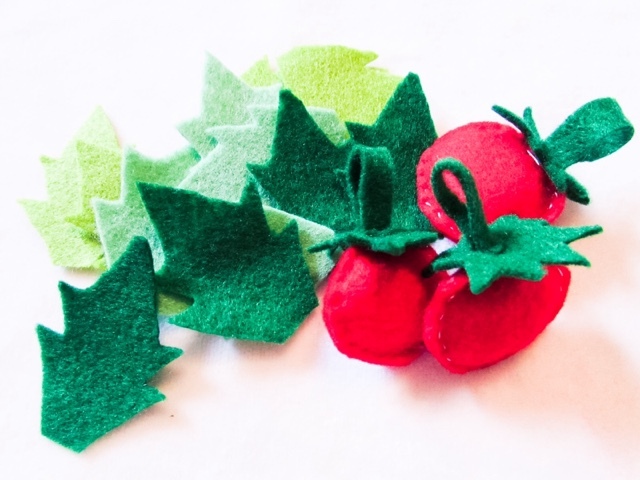 2) To make the tomato plants - cut rounds of red felt out in varying sizes, ensuring you have two of each size. Sew a running stitch around 3/4 of the round, stuff with a small amount of cotton wool and finish sewing all the way around. Out of dark green felt, cut out the star shape on the top and a short strip to make a look. Sew the strip to the star, so that you create a loop. 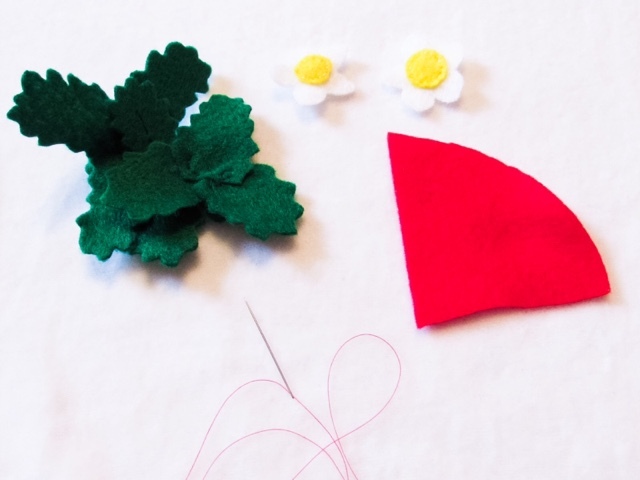 Use a glue gun to stick the green star loop on the top of the tomato you've sewn. Repeat for as many tomatoes as you want. 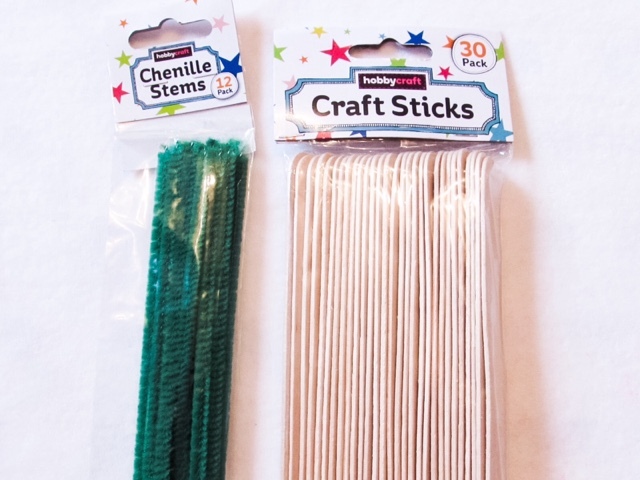 To make the plant glue gun a few green pipe cleaners to the top of a thick craft stick (the pipe cleaners need to be hanging off the top, so that they can be moved to create stems) and leave to set. Next, wrap the craft stick in brown paper, again ensuring that the pipe cleaners are still mostly sticking out. Manoeuvre them to create a variety of stems, bending the end to create a hook to hang your tomatoes on. 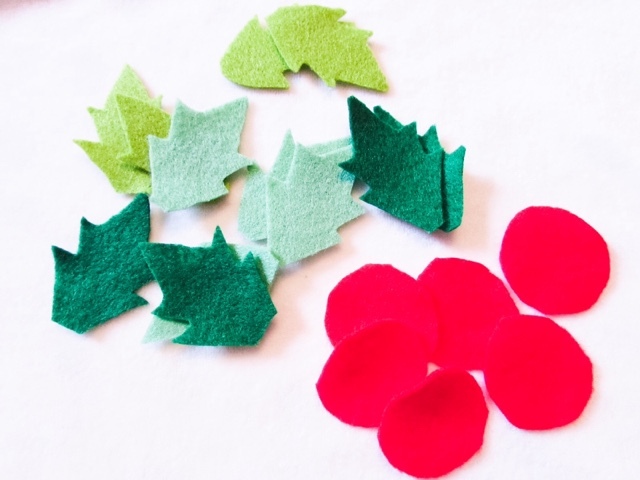 For added detail you can use the glue gun to add leaves cut out from varying green coloured felt. 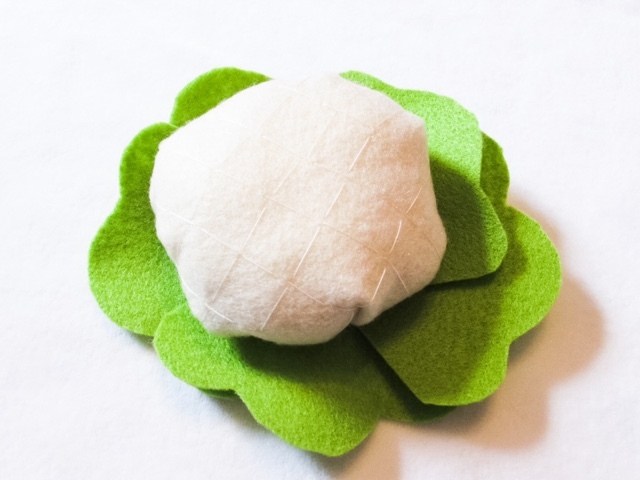 3) To make the cauliflower - Cut out a large circle from the cream felt and using a cream/white thread sew large lines across both ways of the circle. This creates the grid effect on top of the cauliflower. Then sew a running stitch around the outside, when you are nearly back to the beginning pull the thread tight (be careful not to snap it), ensuring the sewn grid is on the outside. Stuff the centre with cotton wool and finish sewing around the edge. 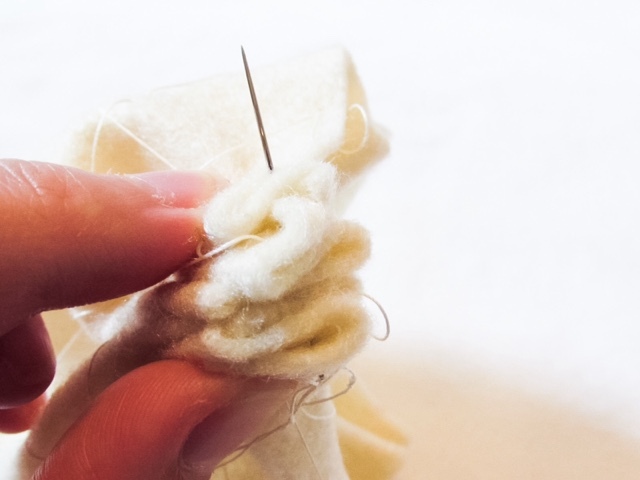 To ensure it is completely closed sew threw the gathered part several times, you won't be able to see this part so it doesn't have to be particularly neat. 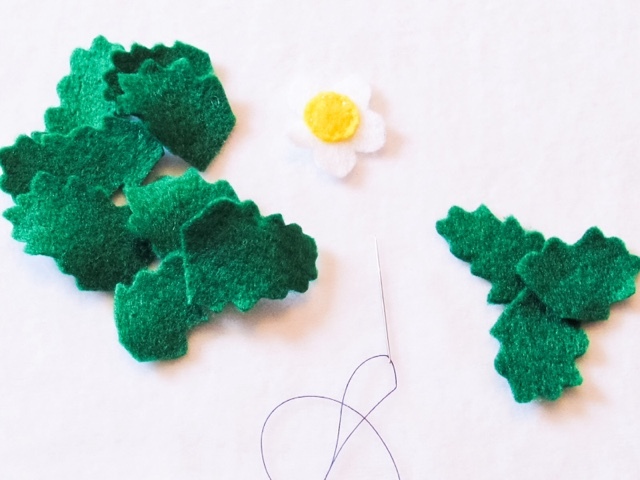 Next, cut out leaves from lime green felt and using the glue gun, place the leaves around the edge/base of the cauliflower. 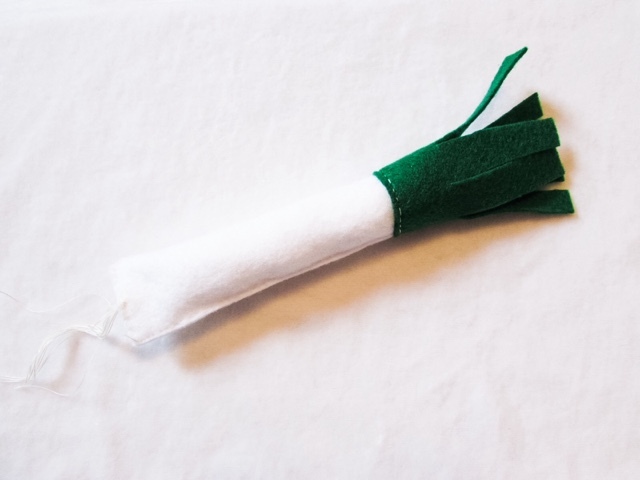 4) To make the leek - Cut out a rectangle from the white felt sheet, fold it in half long ways and sew along the join. Prior to stitching around the top join stuff it with cotton wool. 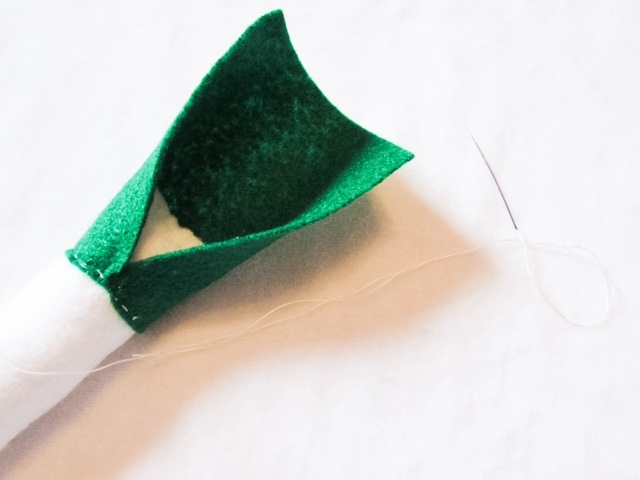 Next, cut a rectangle out of dark green felt and sew that onto one end of the leek (along the bottom and up the side). Cut down the green part of the leek several times to create strips and for extra detail you can use some white thread to create the roots of the leek. 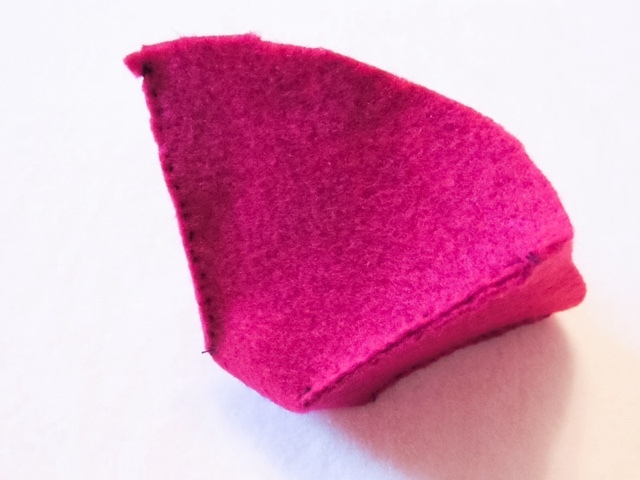 5) To make the strawberry plant - Cut out triangles (with the bottom line being slightly curved, as you can see in the picture), fold in half so that the two straight sides join and sew together. Stuff with cotton wool and then sew the top together. 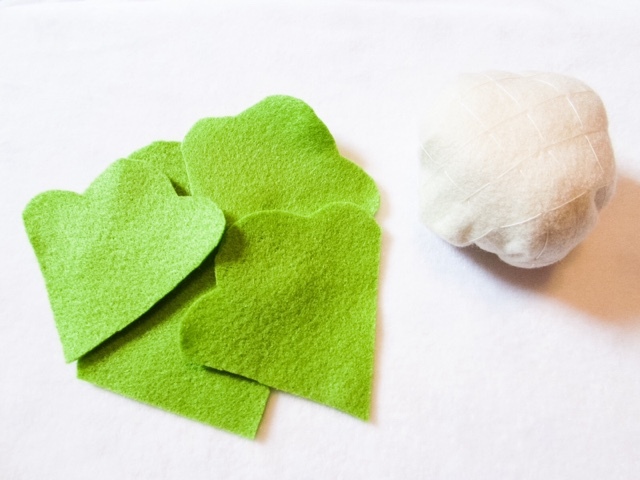 Cut out a piece of green felt and a strip to create a loop like you did for the tomato plant and glue it on with a glue gun. You'll also need to make another plant using the same method as the tomato plant. I also sewed together groups of three leaves and a couple of flowers made from scraps of the white felt and some yellow felt. You can glue these to the pipe cleaner plant. 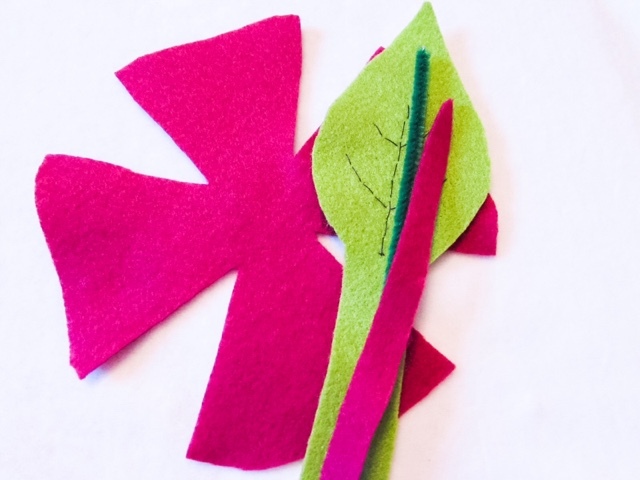 6) To make the beetroot - Cut out the shape below from the rose pink felt, as well as an extra strip of the pink and a leaf with a long stem from the lime green felt. 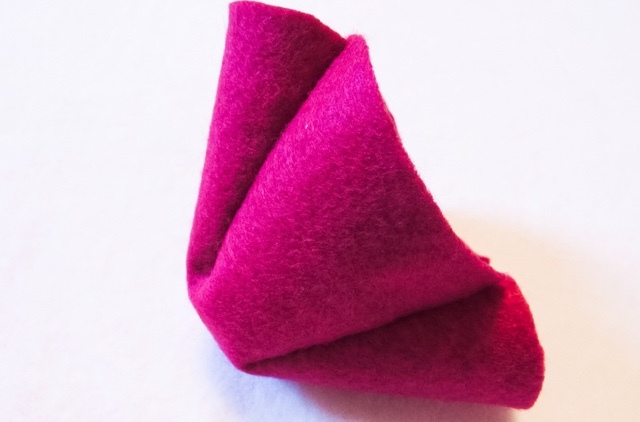 Sew along all of the joins of the beetroot felt, then flip inside out. Stuff with cotton wool and start sewing up the top. Just before it is completely closed poke in the pipe cleaner leaf (use the glue gun to stick the pipe cleaner to the back of the green leaf and then glue the extra pink strip, so that it partially covers the pipe cleaner) and then finish sewing it up. You may need to add a spot more glue to keep the leaf in place. 7) To make the mud - I bought some brown material from Hobbycraft (by the metre, off a roll) and used this almost as wrapping paper. Instead of spending money on stuffing for the mud I raided my wardrobe and choose four clothing items I knew I wouldn't wear anymore. After rolling them up you need to check they fit inside the picnic basket and then cut the brown material to size. I quite literally wrapped up the items of clothing with the brown material, but instead of using sellotape to fix the sides down I sewed along the lines. There you have it! Using almost no skill, very few materials and not much money I had created a felt garden for Isabella. To make this even more of a gift for a lucky little person you could include a mini watering can, silicone plant pots (I have some that are designed to be for cupcakes from Home Sense) and a plastic spade for a spot of indoor 'gardening'. 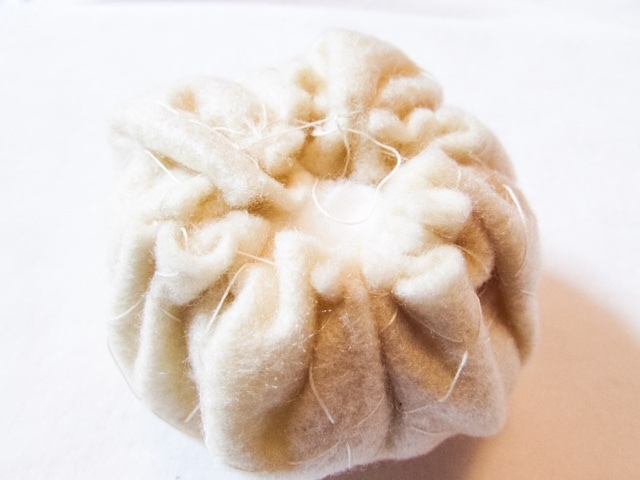 Have you ever tried to make anything from felt? That sounds like so much fun. I bet your daughter loves it. I am probably the least crafty person around so I would struggle with this. I used to sew many years but I stopped and have lost the skill. I love that this is a lot of fun but also not too messy too! It doesn't look too difficult to do either. I'll have to recommend this to my cousin for their children this half term! Thanks for sharing. Amazing! 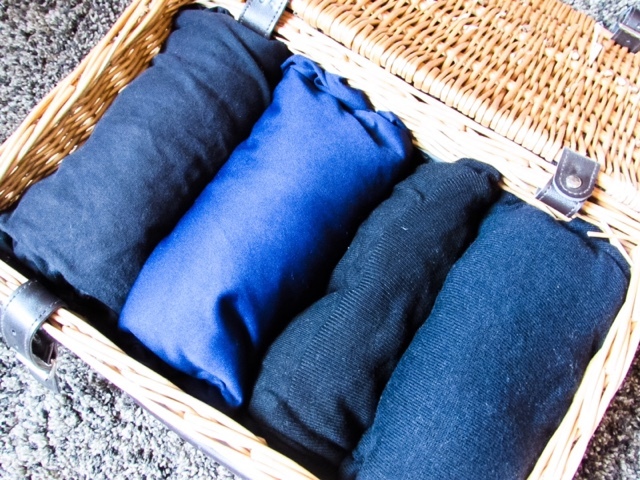 We have a load of old hampers and must try this! I have never tried to make anything like this. Sounds so creative. That's such a cool vegetable garden. We've just ordered a huge craft box for our son so I might give it a try! How absolutely awesome are you? No really - can you get any awesomer? This is such an amazing idea and will probably grow your little ones love for greens and growing things. I wish I had green fingers as it would probably be really therapeutic for me. 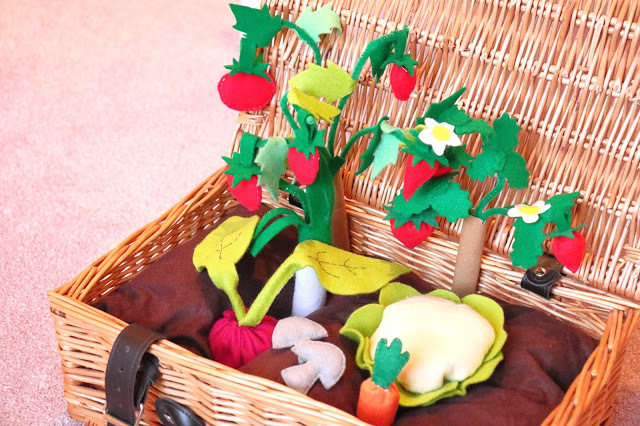 I hope Isabella is loving her new craft vegetable garden!